This moth was in the bathroom almost nine months ago. I’d forgotten that I took the photo. I don’t even know what kind of moth it is: something drab and dusty. There are so few field guides for the really important things like butterflies, spiders, moths, and insects. I have a field guide for North American butterflies but when you are presented with the millions of variations on a theme, the guide is only an educated guess. Is it a Satyr, a Question Mark, a Frittilary or a Skipper? Moths are a side-note. The ugly cousin (for the most part). The nocturnal cousins. I don’t really have anything to add or say – unless someone can tell me what the moth is. For now, it is just my photo of the day. And it is not an ugly step-cousin to the butterfly. That is an incredibly intricate piece of artwork on my bathroom wall. If it had landed on the right tree, it would be invisible to most predators, a perfect match to the pattern of the bark. But it was trapped in my house, drawn to the light and desperate top find the females for which it lusts after. Or it’s a female looking for the male. I think it finally died between the screen and the window. I try not to take these things too personally. Pick the carcass up and toss it away, move on. But a part of me mourns the loss of life. You know that it breathes? If you look very closely, you can see the abdomen move in and out with air? It has a heart that beats? And at some point in it’s life, it changed from a caterpillar to a chrysalis to a moth? All those atoms came apart and reformed the entire structure of the creature? And that the bland colors serve it well, protecting it from predators? It simply amazes me. I try not to think too hard about it, but sometimes my mind just goes to that point in time when a caterpillar moves into a chrysallis and everything comes apart. What was a solid becomes a liquid. And then the atoms reconnect in new ways and it becomes a solid again, but in a totally different shape. Same atoms. I don’t know. 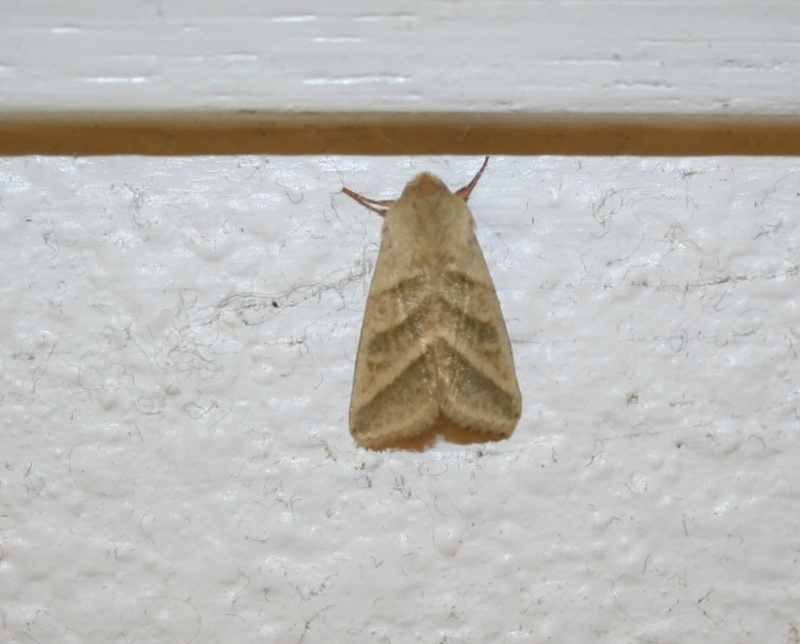 But there it was, clinging to the wall, a sedate but beautiful little moth destined for tragedy.